To answer this question, investigators conducted a retrospective analysis of 29,544 adults with chronic HCV who did or did not receive treatment. The examined medical records covered the pre-DAA (1/1/11-12/31/13) and post-DAA (1/1/14-2/28/17) periods. The project’s data analysis team used Kaplan-Meier curves to examine cumulative risk for receiving HCV treatment stratified by mental health or substance use disorders (MH/SUD). Predictors of HCV treatment in the pre-DAA and post-DAA cohorts were analyzed using multivariate generalized estimating equations (GEE) and modified Poisson models. 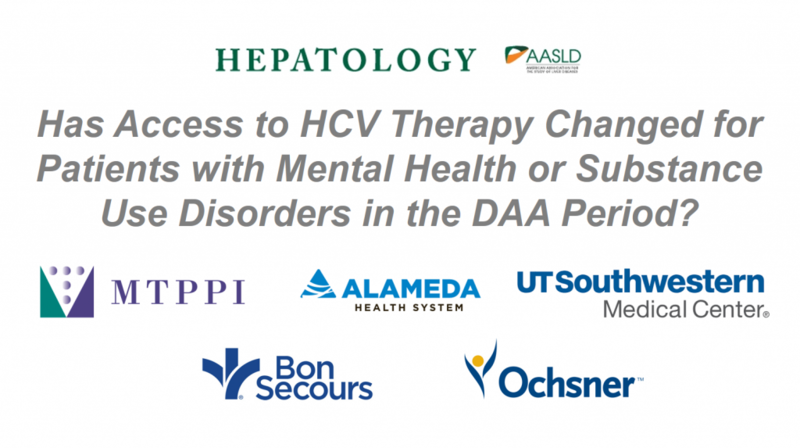 The study team found that overall, 21.7% of those with chronic HCV post-DAA were treated compared to 3.5% in the pre-DAA period. Compared to non-Hispanic Whites, Hispanic Whites were less likely to be treated in the post-DAA period and those with concurrent nonalcoholic fatty liver disease, cirrhosis, and receiving a liver transplant were more likely to be treated post-DAA. Those with MH/SUD were less likely to be treated both before and after DAA therapy was available. The project team is currently working on the second phase of this investigation which will focus on analyzing research questions related to the treatment of Hepatitis B.